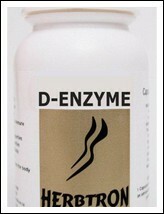 Our D-Enzyme capsules treats Heartburn such as Amylase (which digest Polysaccharides), Cellulase (which digests Cellulose), Lipases (which digest dietary Fats) & Proteolytic Enzymes (which digest dietary Proteins). Facilityates the digestion of undigested of food in the stomach that may be causing indigestion. Can be very effective in the treatment of Allergies by the treatment of Allergies by improving digestion and minimizing the absorption of Antigens in the form of incompletely digested Proteins in Foods.